Please have a read through the terms and conditions that apply to Belt and Bevel’s online shop as well as storefront. By using the website for browsing and/ or purchase you are agreeing to the below. Postage days are Tuesdays and Thursdays, via the most efficient means. Australia post takes preference and we may also use OfficeWorks parcel service or courier for larger or bulky items. We will contact you first to arrange and discuss shipping options if required. Colours, some features and suppliers change from time to time. These won’t necessarily be updated in all photos or descriptions. If you need specifically what you see in the image, please check first. No credit card or banking details are kept by Belt and Bevel. All card details are processed via PayPal so please refer to their privacy statement for more details on card storage. We will keep postage and contact information in a secure and diligent manner only for the purposes that it was given. This includes sending and tracking the order as well as keeping a history on orders. We do not distribute any personal information outside of Belt and Bevel. An administration charge will be added if orders are completed outside of the webstore for items shown in the webstore. The Business is based as a webshop, so there is extra time spent to run orders for customers not completing their own checkout process. On request of refund, if the fault was at our end for example the part doesn’t refer to the correct item that was listed we will take this free of charge. If a return is made for change of mind then a 20% restocking fee is charged. There are no returns on electrical or electronic items as well as special orders. The part being returned must be in exactly the same state and function that it was dispatched in. 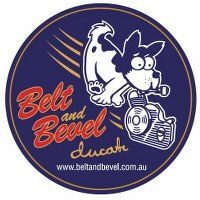 All images, written content and items listed on the website are the intellectual property of Belt and Bevel Pty Ltd protected under copyright. We can allow the use of the content, restricted to only the items outlined for use by third parties. Please contact us to discuss the use of any content. Special order items may require payment upfront at the discretion of Belt and Bevel, we will contact you to discuss this if this is the case. Special orders include non stock items or high value. If an order included backorder items, the customer is to check their invoice for what is waiting, We can include the estimated time for it to become in stock again and then given the option of holding for the whole order to be filled, or at cost a second backorder parcel to be sent when the backorder is filled. Some items backorder time is out of our control. We reorder as soon as possible but there are delays from manufactures, shipping and customs. Payment options are via PayPal connected to Belt and Bevel Pty Ltd via the website or a PayPal invoice. Or via direct bank transfer. When making a bank transfer, please include the invoice number as reference. Belt and Bevel will hold the order till payment has cleared. All totals include Australian GST. For dispute resolution please contact info@beltandbevel.com.au in the first instance as we want to work through any issues and keep happy customers. In stock (Can be Backordered) means that the part is in stock with us and is ready for dispatch. It also represents that we can also still get more if required. We keep tight stock control so the website should display the correct status of a part. In stock means that the part is in stock for immediate dispatch, but after this stock is gone there are no more available unless a new supply is found. Available on backorder means that is it a part we stock and has already been or will be back filled shortly. Feel free to still add items to your cart showing this symbol, and we will clearly communicate with you on the lead time on the back order. Out of stock. This makes us sad but is inevitable. Some parts we did once stock are now no longer available. Unless we find a new supplier of the item then it will be listed NLA and unable to be ordered. We leave NLA parts up as reference for part numbers, dimensions, style and cost. Analyse the use of the website, to improve your experience and the website usability. These cookies are used to collect information about the users’ surfing behavior within the website, keywords used to find our website, websites you visited and where you come from for marketing campaigns. We can use this information to file reports and improve our website. Cookies collect information in an anonymous form. This type of cookies could be sent from our website or by third party domain. The use of other types of cookies requires the users’ consent, according to the official regulations, through browser settings and computer software or devices that users can use easily and clearly. We remind users that they can change their cookies preferences in every single moment. You’re always free to block, delete or disable cookies from your browser, however, if you decline cookies or other similar technologies, you may not be able to take advantage of certain website features.